I’ve recently been trying to get more organized. My storage space in particular was very chaotic and I’ve put a lot of work into getting that cleared up. I realized during a yard sale a couple weeks ago that a lot of what was in there wasn’t worth trying to sell – it was just making my best items harder to see. So, I’ve been a purging a lot of my more mediocre stuff, putting the rest in “free” boxes on the curb that others can then hunt through. Most ends up getting taken, and the things that don’t probably weren’t worth saving. I have a lot less clutter now, and most of what remains is very yard sale-able. Otherwise, I had a couple blog posts worth of stuff in storage just sitting around waiting to get photographed. 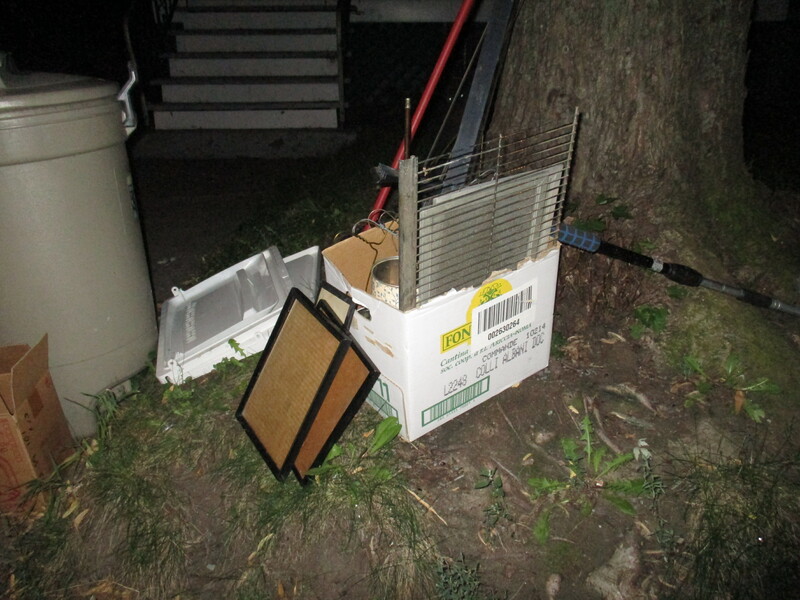 It all came from a run in Rosemont I did a few months ago, some of which I discussed in a recent post. 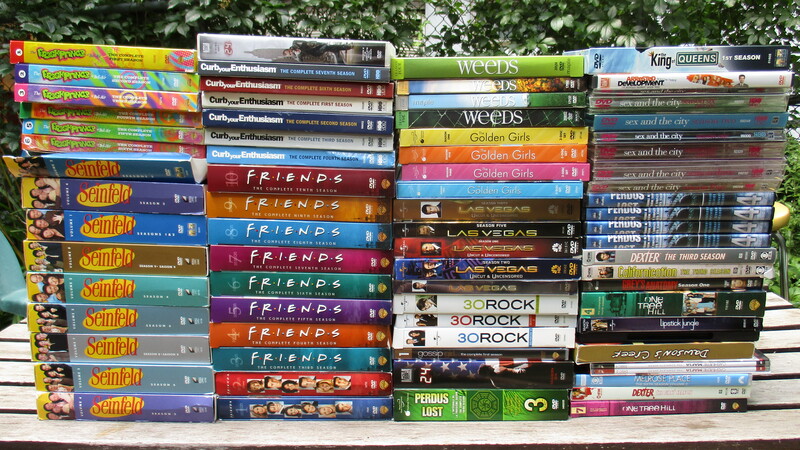 I came across this pile later on that day. It was pretty unpleasant to look through because everything stunk badly of cigarette smoke. I found some good stuff regardless, most of which is easy enough to clean. A lot of what you see here will end up in a free box though, as not all of it is worth the time it will take me to remove that nasty smell. 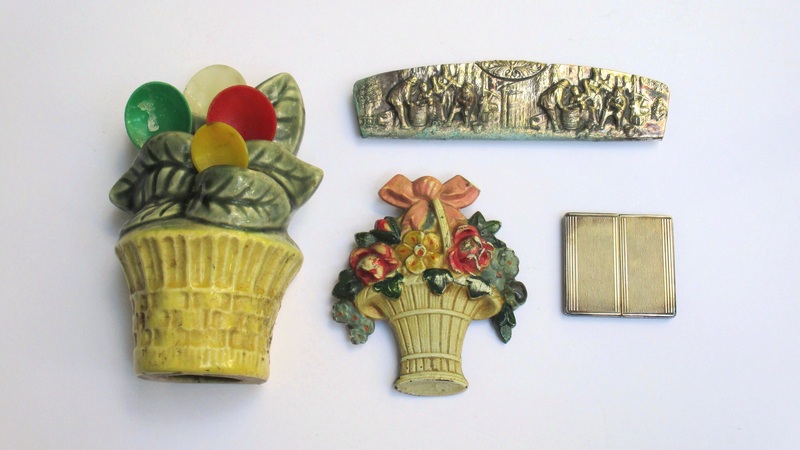 I saved a few larger tchotchkes, including a weird vintage mug (marked “©MK” on the bottom), a brass duck, and a ceramic elephant with a multicoloured glaze. This person was really into elephants, and you can see below. I mostly saved smaller items, four of which were in the shape of elephants. 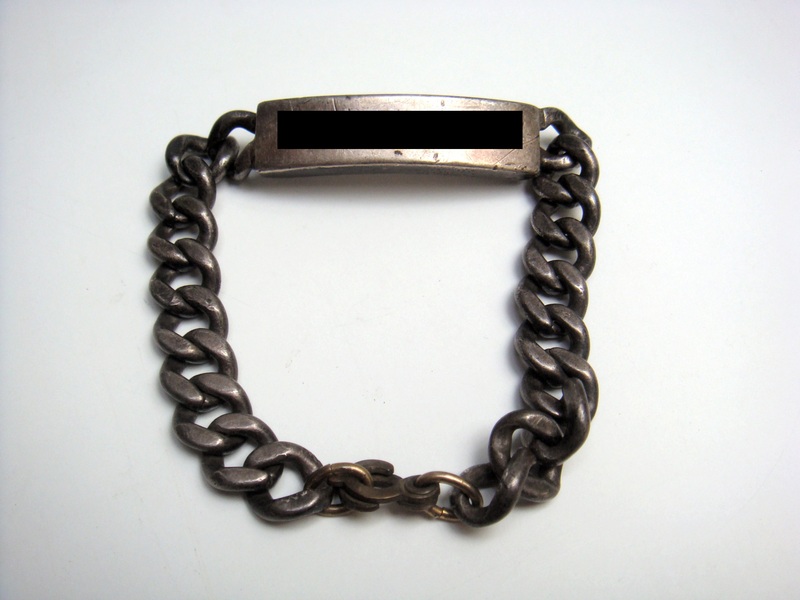 Two were keychains, one was a small brass figurine, and another was a brooch. The brooch (just left of the spoons) is actually quite nice. 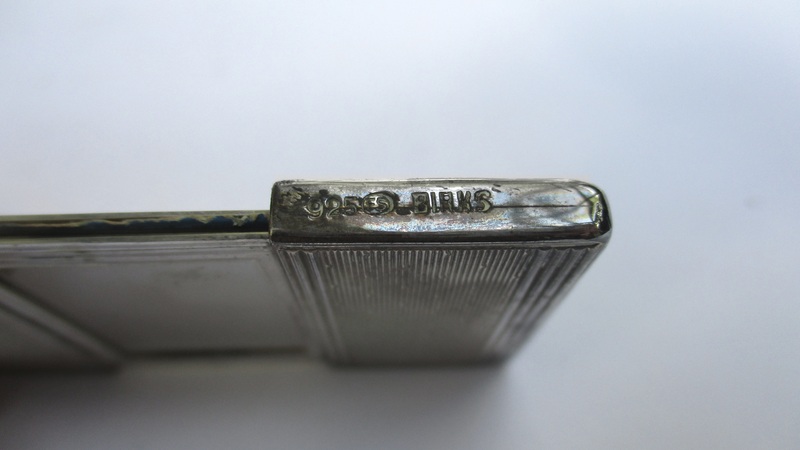 It’s marked D’Orlan on the back, which is a Canadian costume jewellery company that produced some very nice pieces. Similar brooches are selling for between 30-60$ on eBay, and mine is in very good shape aside from the fact that it’s missing the rhinestone eye. 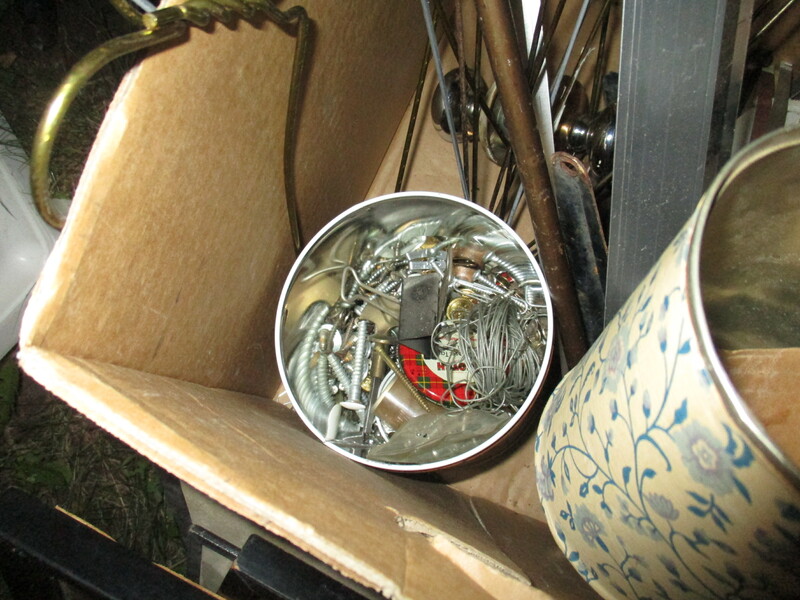 I otherwise saved a couple Las Vegas casino chips, two silver plated spoons, two pocketknives and a Duran Duran pin. 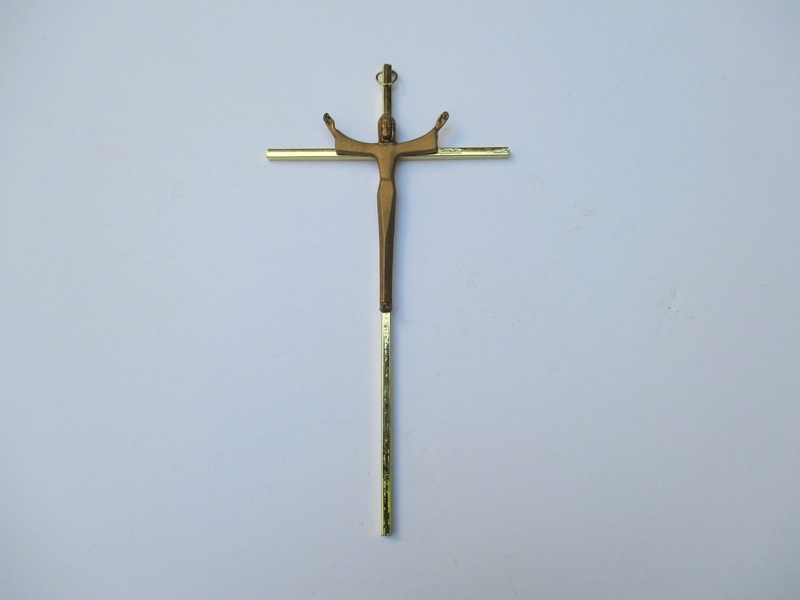 … and a metal crucifix. 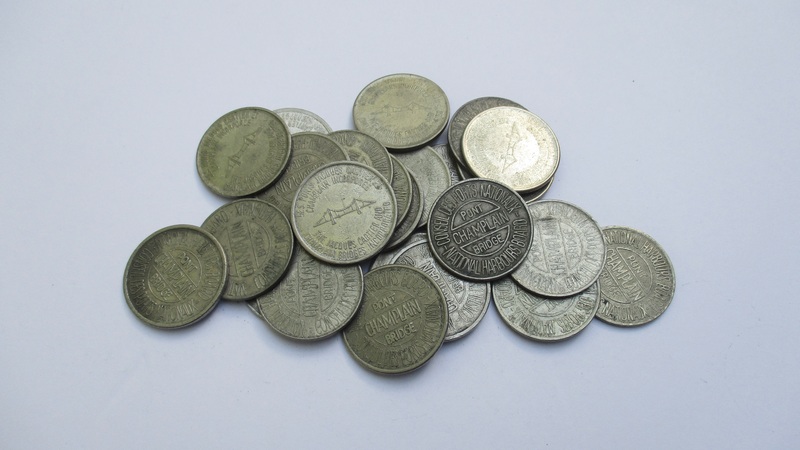 … a collection of old bridge tokens. It seems like a lot of people collected these as I’ve come across them several times now, sometimes in large quantities. 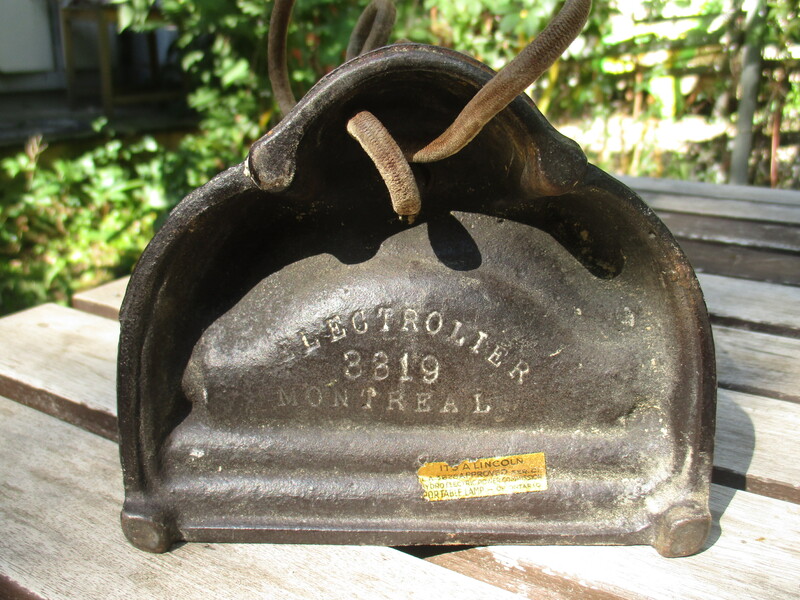 They were used between 1962-1990 to pay the toll at the Jacques-Cartier and Champlain bridges. They’re not worth much, but again make for good yard sale material. 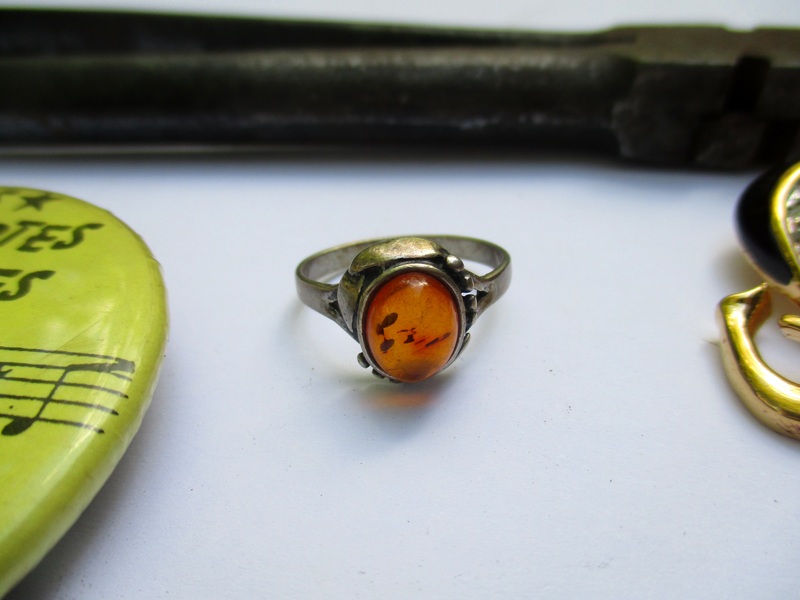 I’ve listed a lot of new stuff in the past few weeks, some of which sold very quickly. Below is an account of my sales from the two week period beginning August 3 and ending August 16. The vast majority of these items came from very well-to-do neighbourhoods. 1. 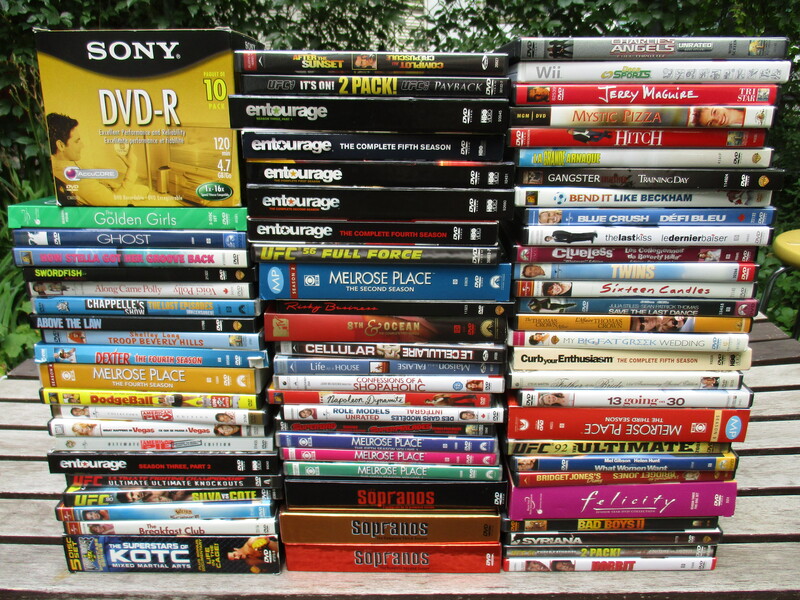 Big DVD collection: Sold on Kijiji for 180$. This was a lot easier than I expected and I was very happy to be able to unload them all at once. I’m sure I could have gotten more money selling them on eBay but by selling locally I saved myself a bunch of work and stress. Found not long ago in Mount Royal. 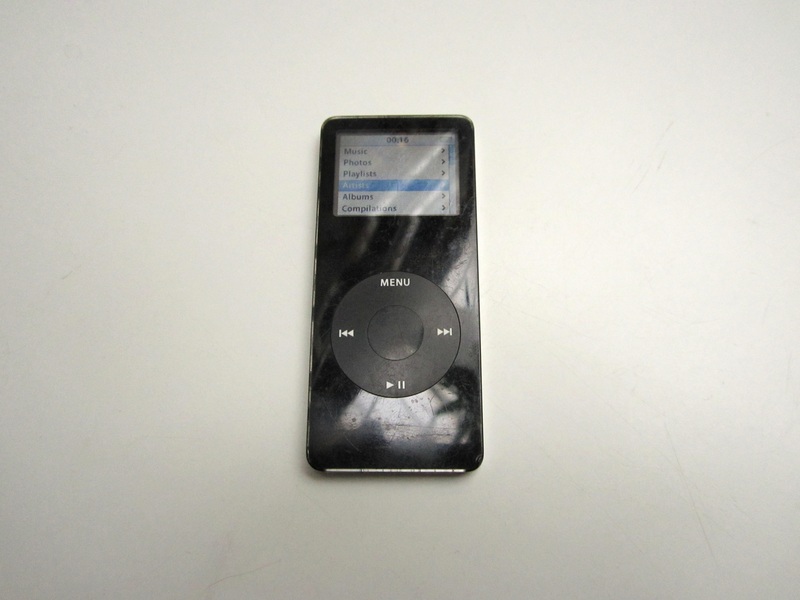 2. iPod Nano: Sold on Kijiji for 50$. 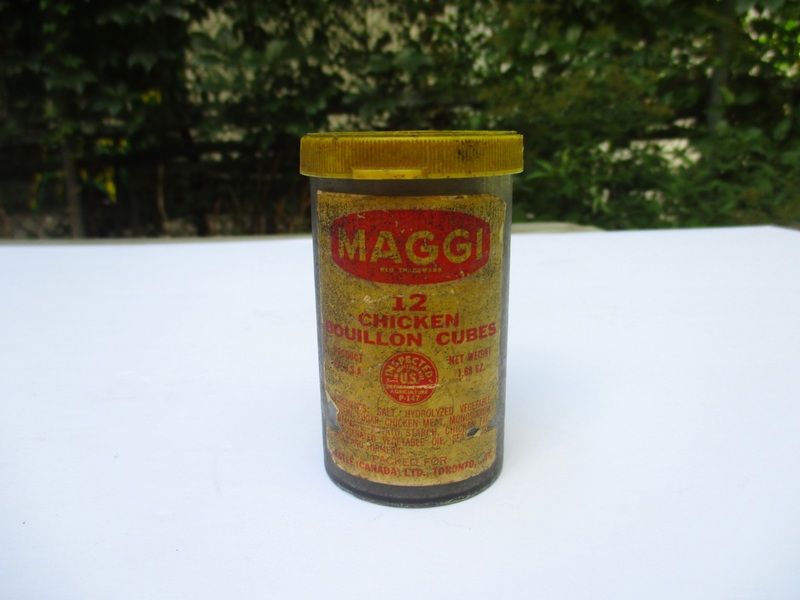 Found in Westmount May 2015. 3. 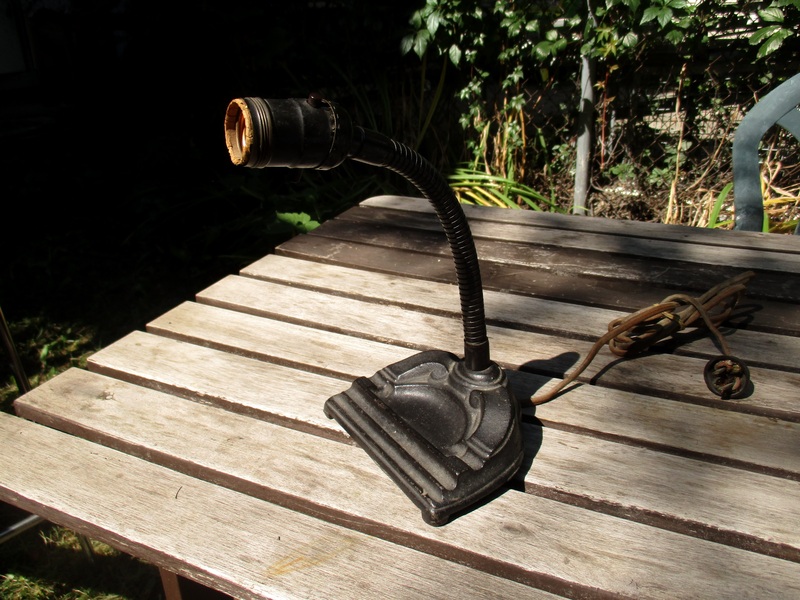 Binoculars: Sold to a reader for 10$. Found May 2015 in Mount Royal. 4. 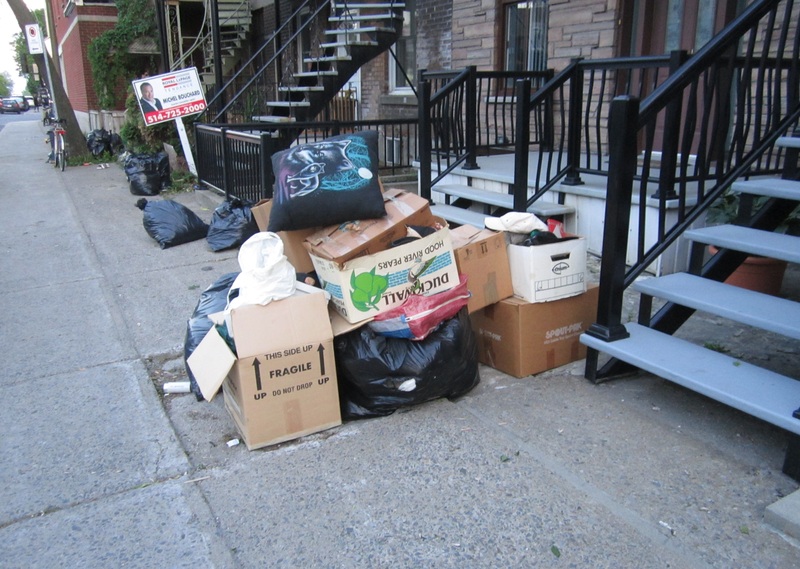 Yard sale: Many small items for 198.75$. I just missed the 200$ mark but I’m happy with the total. I plan on doing another sale this weekend; it’s supposed to be quite nice out. 5. 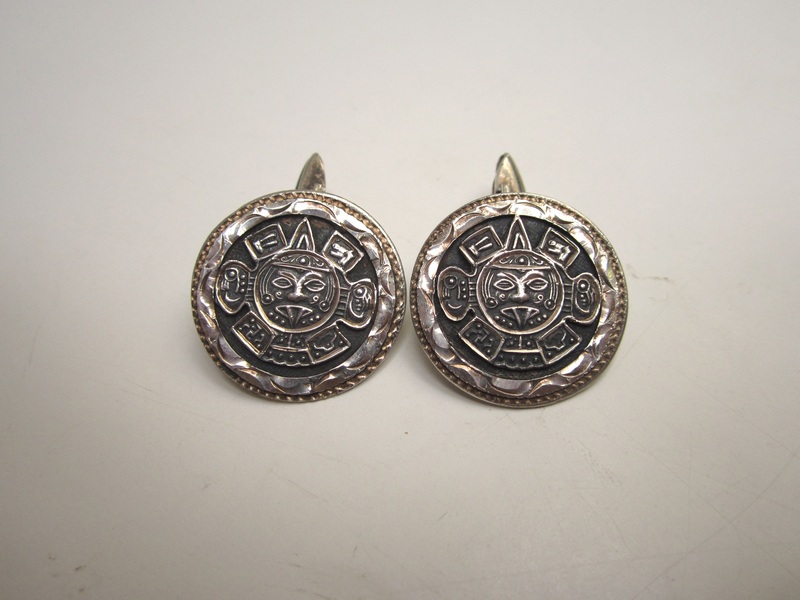 Mexican silver cufflinks: On Etsy for 35$. Found nearly two months ago in Westmount. 6. 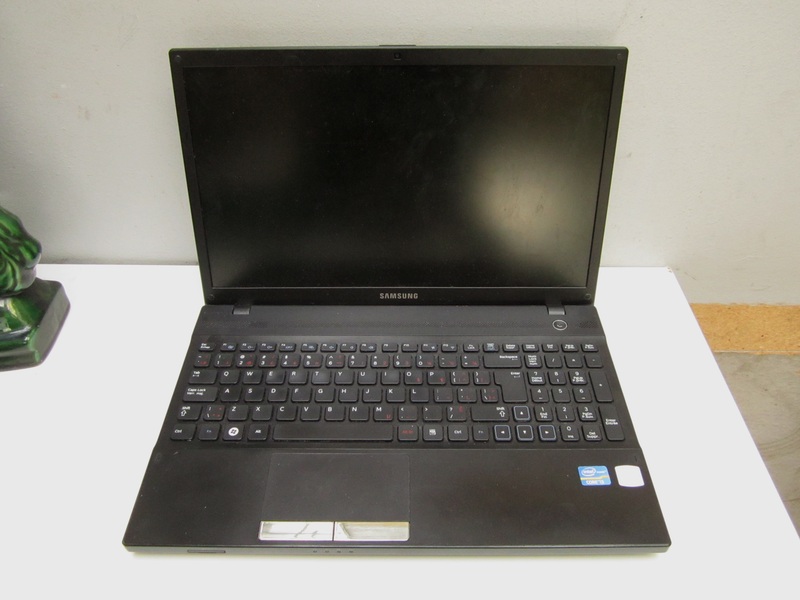 Busted Samsung laptop (for parts or repair): On eBay for 70$. This sold within a few days of being listed. I love it when that happens! Found late June in Westmount. Positive feedback already received. 7. 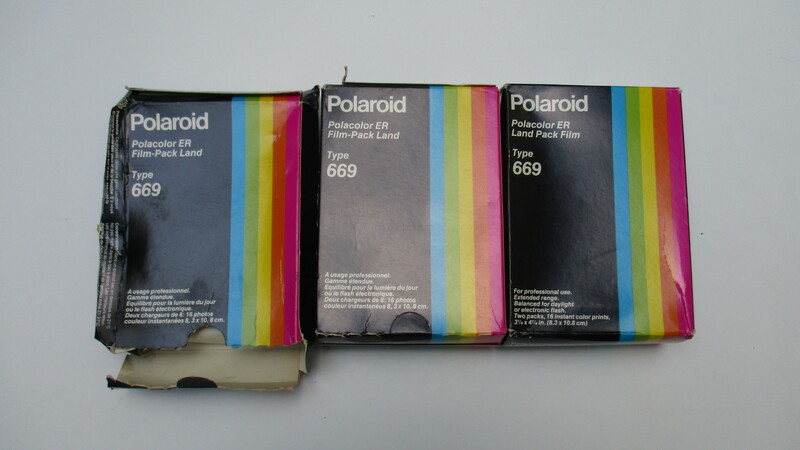 Polaroid film (expired 1983): On eBay for 60$. Another quick sale! Found a few weeks ago in Mount Royal. 8. 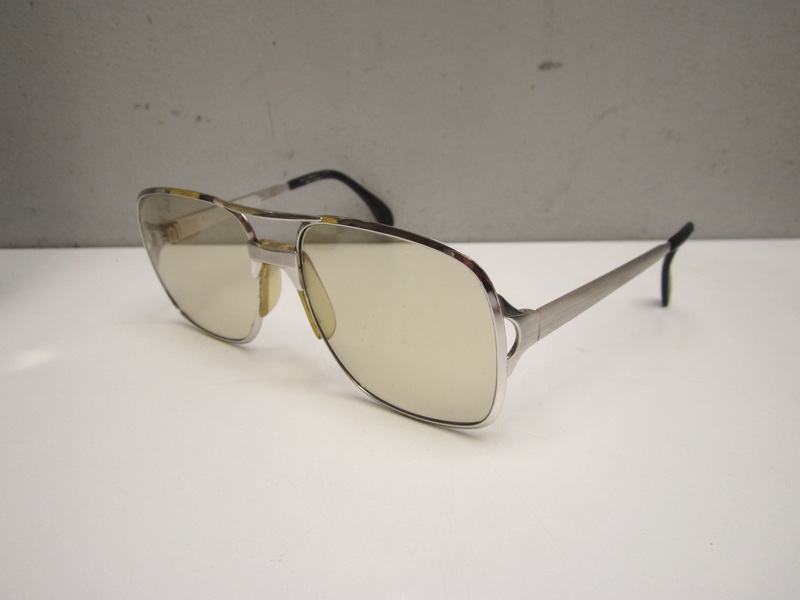 Metzler Germany Zeiss Umbramatic sunglasses: On eBay for 100$. Found mid April in Hampstead. Positive feedback already received. 9. 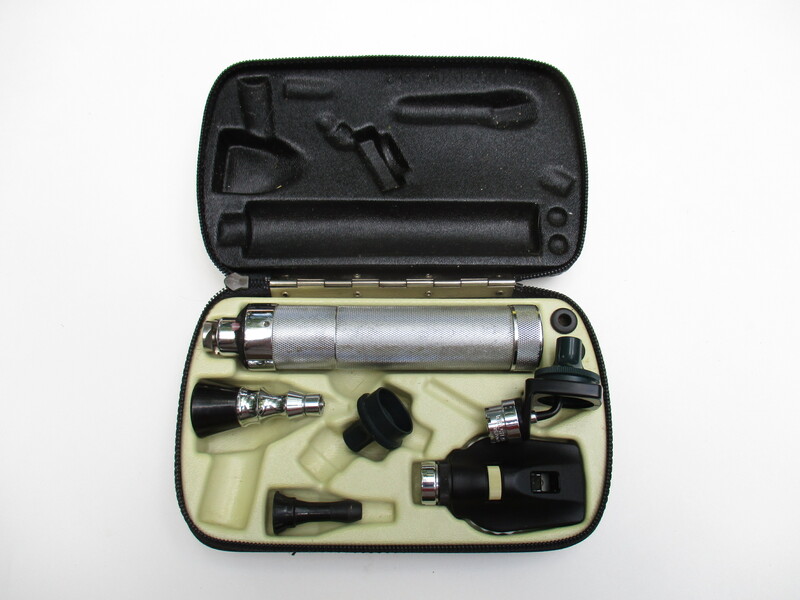 Welch Allyn diagnostic set: On eBay for 65$. These were medical diagnostic tools of some kind. I wasn’t able to test them but they still sold for a nice price. Found a few months ago in Westmount. 10. 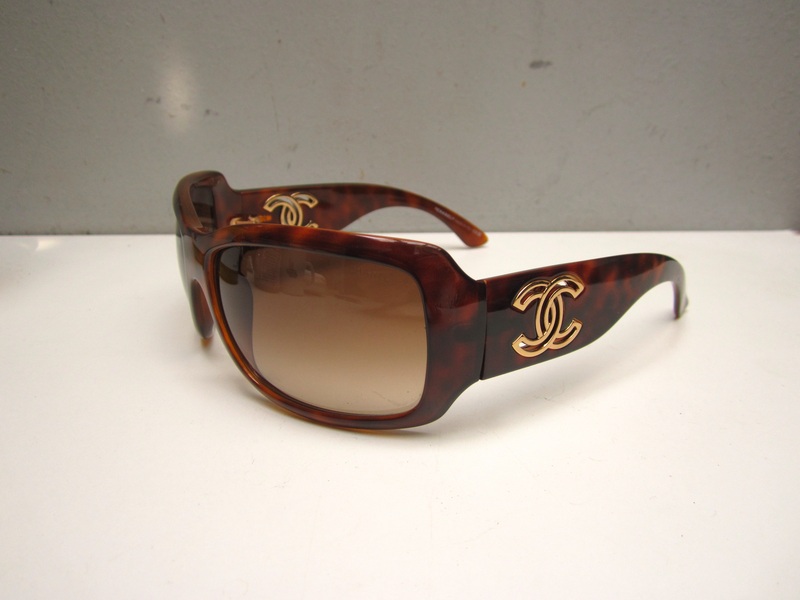 Chanel sunglasses: On eBay for 150$. A nice sale! These were in great condition. Also found a few months ago in Westmount. 11. 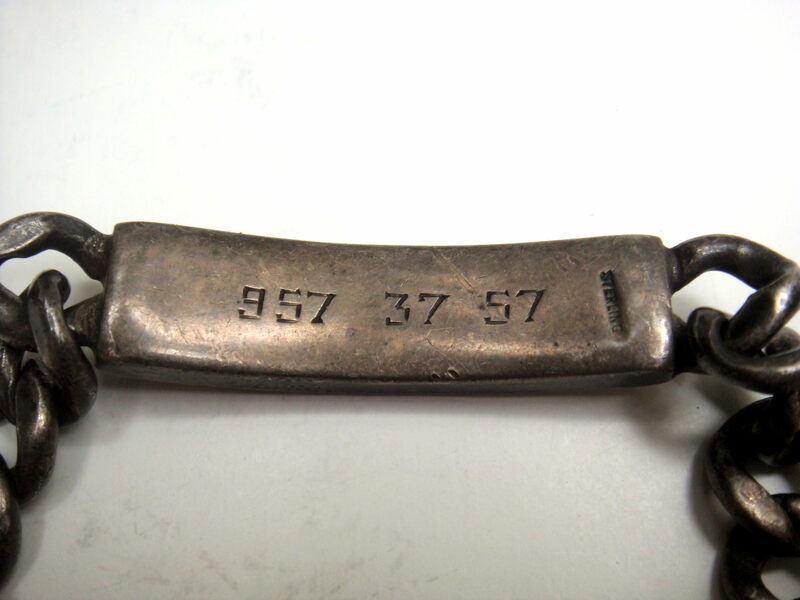 Sterling Silver WWII US Navy ID bracelet: On eBay for 100$. 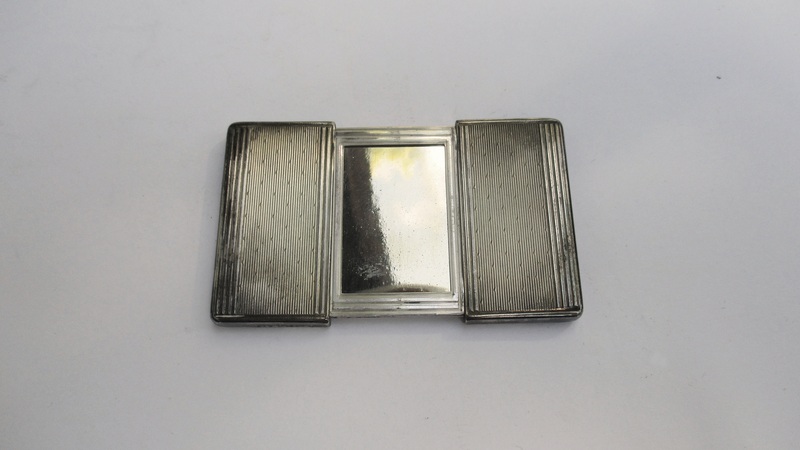 This was a great piece, one I would have kept myself if I was richer. The sale was a bit weird, as about five days after I shipped the item eBay sent me an email telling me not to ship because the buyers account no longer existed. Well, it was too late for that! I didn’t get a tracking number so there’s no way to prove I sent it if he tries to scam me, though the fact that the guy’s account is likely suspended makes it difficult to impossible for him to complain to eBay. Anyways, I hope it all works out, and the experience has taught me to get tracking numbers more often going forward. Found nearly a year ago in St Henri. 12. Small change: Converted to a more portable 34.83$. The person who guessed 40$ was closest! I also traded three American dollar bills for 3.80$. 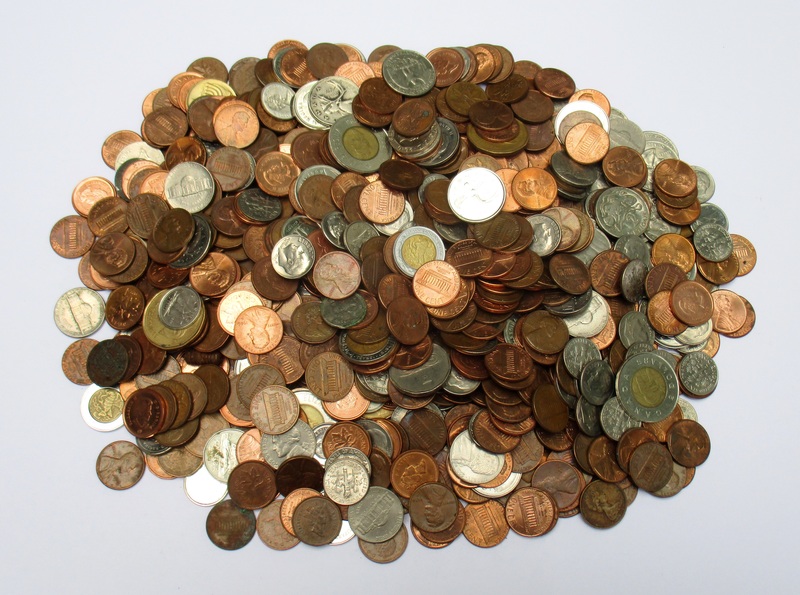 Total: 1048.25$, 12800.75$ since the new year began. This was one of my best two-week periods in a while. It definitely helps having more things listed on eBay. I’ve been using Kijiji more often lately, and will likely continue to do so for items with general appeal or that are annoying to ship. As usual some of these prices are negotiable, particularly if you live in Montreal and are able to come and pick it up. 18. Ray Ban Clubmaster sunglasses (Sold! Will appear on my next sales post).